Wine Consumption Continues to Rise in the U.S. As reported in the 2012 Wine Handbook, wine consumption increased 3.0% to reach 312.4 million cases in 2011. Wines from California, Oregon and Washington continue to be popular and outpace imported wines. The 2012 Wine Handbook is available for $850 at www.bevinfostore.com. Gallup’s annual Consumption Habits poll (completed July 9-12, 2012) found that 66% of Americans consume alcohol and drink an average of four drinks a week. Beer is still the preferred drink of Americans, but wine is a close second (35% compared to beer’s 39%). Men drink more, consuming 6.2 drinks, on average, in the past week, compared with 2.2 drinks, on average, consumed by women. More men admit to consuming more alcohol than they should. Men aged 18 to 40 are the heaviest drinkers of any age or gender group. MacPhail Family Wines to Open Tasting Room at Barlow Winemaker James MacPhail announced that the new tasting room will open in early 2013 and will offer vineyard-designated MacPhail Pinot Noir and appellation focused wines from Sequana. The old Barlow Apple Processing Plant in downtown Sebastopol is being repurposed as a gathering of local food and wine artisans. It is a good fit for MacPhail whose family has roots in the coastal agricultural community dating back to the 1800s. Visit MacPhail on the web at www.macphailwines.com, Sequana at www.sequanavineyards.com, and learn more about the Barlow. Aubert Tasting Salon Open The Aubert Wines Tasting Salon, located at 333 Silverado Trail in Calistoga, opened September 4 after extensive remodeling of the former August Briggs winery. (August “Joe” Briggs sold his namesake wine label to a partnership including winemaker Jesse Inman) Aubert customers will have their first opportunity to visit the winery and taste both latest releases and library wines, by appointment. Philip Gift will be the new Retail and Guest Relations Manager. Aubert Wines produces Chardonnay and Pinot Noir from single vineyard sites in the Napa Valley, Carneros and Sonoma Coast appellations. Aubert Wines was founded in 1999 by Mark and Teresa Aubert and started with but one Chardonnay. Now Aubert produces six different single-vineyard Chardonnays and five Pinot Noirs, and owns three estate vineyards in the Napa Valley and Sonoma Coast appellations. The winery website is www.aubertwines.com. French Unhappy With Breathalyzer Law The French government is hoping to decrease alcohol related driving deaths by requiring every driver in the country (even tourists) to have a personal breathalyzer on their person while driving or face a fine of 11 euros. The law goes into effect November 1, 2012. France’s drinking limit of 0.05% blood-alcohol content (0.25% in the breath) already is lower than the United States (0.08%) and is roughly the equivalent of two glasses of table wine. The French, who are not immune from scandal, are claiming the law represents a conflict of interest in the breathalyzer test market. The man who heads the nonprofit road safety association that lobbied Parliament to pass the breathalyzer law is also a parttime employee at Contralco, the only company making certified breathalyzers in France and has up to 90% of France’s breathalyzer market. San Francisco Vintners Market - Harvest Hoopla This event will be held Saturday and Sunday, November 17 and 18, 2012, at Fort Mason Center. About 200 wineries will participate and will be selling their wines direct to the consumer, something many consumers have begged for at walk-around wine tasting events, and the first of its kind wine tasting and buying experience. Consumers can sample the wines on display and buy them on the spot. Wineries throughout California, other regional wineries and international wineries will participate. Visit www.sfvintners6.eventbrite.com for tickets. California Increasing Vineyard Acreage From www.norcalwine.com comes the following figures. In the past five years, California added 76,651 acres of wine grape vineyards, an increase of 17.5% from 2006 to 2011. The California counties that added the most acreage were San Joaquin (10,783 acres), Fresno (9,651 acres), Monterey (9,595 acres), Sonoma (8,777 acres) and Napa (7,332 acres). Tiny Marin County saw a 65.8% increase in acreage and now has 167 acres in 2011. Another Pinot Noir producing county, Santa Cruz, has 445 acres as of 2011. Stoller Opens New Tasting Room Stoller Family Estate, at 373-acres, is the largest contiguous vineyard property in the Dundee Hills. Melissa Burr, who has been the winemaker for ten vintages, directs the production of estate-grown Pinot Noir and Chardonnay at three tiers: the legacy tier includes barrel selections honoring Stoller family members, the reserve tier includes the SV Pinot Noir that will become the Reserve Pinot Noir with the 2010 vintage, and the estate tier which features JV Pinot Noir, Chardonnay and Rosé. The grand opening of the new tasting room will be September 10. The tasting room energy will come from a solar panel, and construction features a green roof, skylights, and salvaged timbers from Powell’s Bookstore in Portland. The tasting room will be open daily from 11:00 to 5:00 at 16161 NE McDougall Road in Dayton. Visit www.stollerfamilyestate for more information. Hyland Estates New Label for Venerable Hyland Vineyard Hyland Vineyard is one of the Willamette Valley’s oldest vineyards, first planted in 1971. 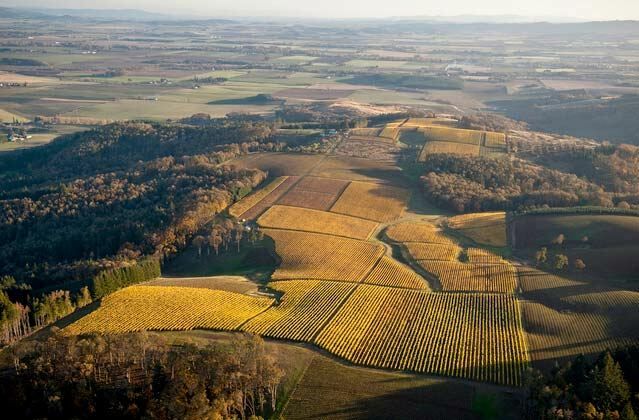 Located just outside of McMinnville, the current owners are NW Wine Company principals John Niemeyer, Laurent Montalieu and Danielle Andrus Montalieu. The new label, Hyland Estates, was launched in 2011 with the opening of a new tasting room in Dundee on 99W, offering wines from the 2008 and 2009 vintages. Hyland Estates produces Pinot Noir, Riesling and Gewürztraminer. The history of Hyland Vineyard is closely tied to Charles Coury and the Coury Clone (see “Solving The Mystery of the Coury Clone” at www.princeofpinot.com/article/1214/ and Oregon Wine Press (September 2012). Hyland Vineyard now spans 204 acres and is one of the largest single plantings in the northern Willamette Valley. The Hyland Estates brand focuses on the oldest blocks in the vineyard, with winemaker Laurent Montalieu crafting one Pinot Noir solely from old Coury clone vines. A Harvest Celebration will be held at Hyland Estates, 20980 N.E. Niederberger Road, Dundee, on September 29. Visit www.hylandestateswinery.com. 2013 Oregon Wine Press Superior Cellar Awards Announced Oregon Wine Press and the Oregon Wine Board work together to select Oregon restaurant wine lists throughout the United States that feature Oregon wines prominently among their wine list offerings. 63 Oregon restaurants received Superior Cellar Awards in 2013. See the full list of restaurants in the September 2012 issue of Oregon Wine Press.